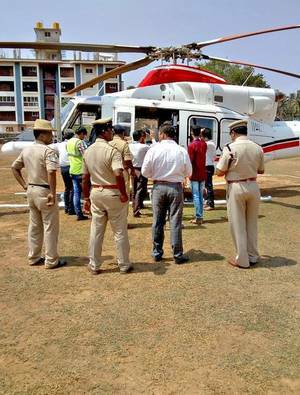 Mangaluru, Apr 16, 2019: Election Commission officials searched and checked the helicopter used by Defence Minister Nirmala Sitharaman after she landed at Karwar for campaigning for her party candidate in the Lok Sabha elections on April 15,Monday. The helicopter was checked at Bandishitta Helipad at about 2 p.m. after the Union Minister alighted. She arrived at Karwar to campaign for Union Minister for Skill Development and Entrepreneurship Anantkumar Hegde who is facing elections from the Uttara Kannada Lok Sabha Constituency for the seventh time. MLA Hegde has won five times. Minister Sitharaman left for Goa after campaigning in Karwar, sources said. Earlier, Election Commission officials also checked the vehicle of Chief Minister H.D. Kumaraswamy in Uttara Kannada when he had visited the constituency to accompany Anand V. Asnotikar, Janata Dal (Secular) and the Congress combine candidate, while filing his nomination papers.